If this is true, then it shows that the Tory party is in a very dire situation, no matter what their cheerleaders in the media are trying to get us all to swallow. Mike has put up on his blog a piece reporting an article stating that the Conservative party in London is so afraid of being absolutely wiped out at the council elections in May, that they’re considering breaking away to form a separate party with its own name and programme. I’m not entirely convinced, but it wouldn’t surprise me if it were true. A decade or so ago, at the height of Blair’s administration, one of the Tory journos wrote a piece in the Daily Mail about a similar eventuality. He also believed that the Tory party was in danger of dying out completely, and so recommended that they should become ‘the English Nationalists’. This was obviously when the SNP were riding high north of the border as support grew in Scotland for devolution, and the Welsh were also gaining their own, rather more limited measure of autonomy. It was about the same time that there were demands for an all-English assembly to debate matters affecting only England. It was an anti-Labour measure, as the Tories had rather more MPs than Labour in England, and hoped to gain a great measure of power by stopping Labour MPs from elsewhere in Britain voting on English matters. The Tories were clearly trying to whip up English nationalism in order to gain votes. Just like they’ve always whipped up xenophobia and hate against those they consider outsiders, like Blacks, Asians, Jews, immigrants, the poor and disabled. I never really took the suggestion that the Tories would reform themselves as a differently party seriously, but I’ve been told by others that it was seriously considered. It’s supposed to be described in the book, True Blue, which talks about how under Cameron they fought back from near collapse. London’s a world city, with a large Black and Asian, and immigrant population. Brexit, and the return of racism under the Tories, threatens these people. And the Grenfell fire tragedy and the Tories’ refusal to honour the promises they made about fire-proofing buildings and putting those left homeless into proper accommodation, shows the absolute contempt they have for some of the poorest members of our society. Who happen to be Black, Asian or immigrants. And this is apart from the growing inequalities of wealth in Britain generally, which is becoming particularly acute in the nation’s capital. Ordinary people are being priced out of London as more and more property is bought up by the rich upper and middle classes. It’s either gentrified, or else ‘landbanked’. Which means that it’s kept purely as a property investment by rich, often foreign investors, who make sure that it remains unoccupied. And I’ve no doubt people do still remember the ‘poor doors’ in one apartment block. These were a separate entrance put in so that the rich people living there wouldn’t have to rub shoulders entering the building with the hoi polloi. This, readers of H.G. Wells’ science fiction, will be aware is like the origin of the split between the eloi and the subterranean, cannibal morlocks in The Time Machine. 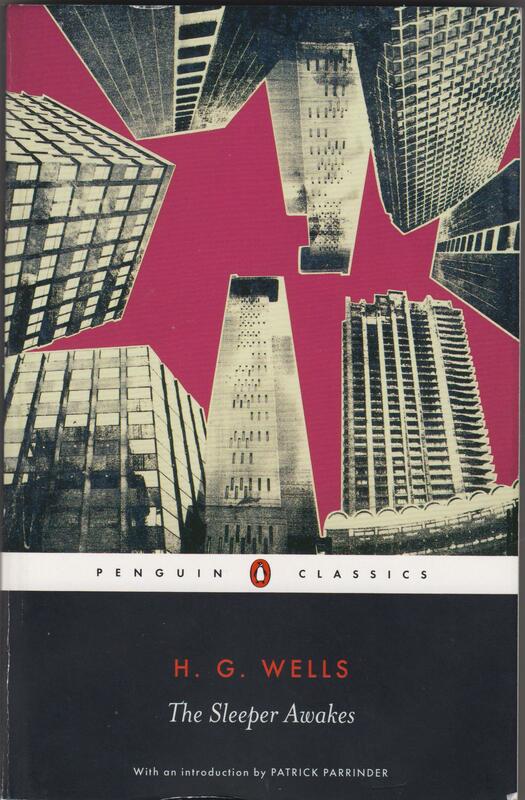 Wells based it on how the upper classes in his time wanted to force the working class underground, to tend the machines safely away from their sight. Trained as a biologist, Wells projected the split far into humanity’s evolutionary future. And the result was not only an SF classic, but a criticism of the class attitudes and contempt for the working class in Victorian society. Whether the Tories in London are planning to form a new party or not, I hope they are wiped out in the May elections. For forty years they have done nothing but try to privatise the health service piecemeal, deliberately running it down for the benefit of private healthcare companies. They’ve privatised the utilities to foreign investors, who have not given customers the service that they were promised. All again for corporate profit. And they’ve carried on New Labour’s project of benefit sanctions and the work capability test, all to make it increasingly difficult for the poor and disabled to get the state aid they need. This was in line with Tory policy under Thatcher, and followed the advice of the private health care insurers, like Unum, who were advising Peter Lilley and the Tories. As a result, hundreds of thousands of people now have a choice between eating and paying the bills, and tens of thousands of disabled folk have died after being found ‘fit for work’. The sooner the Tories suffer a devastating electoral defeat, the better. And I hope it’s truly catastrophic. 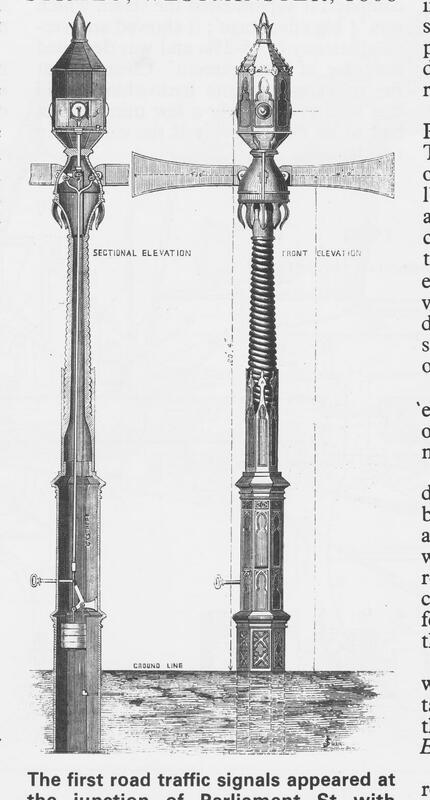 I’ve posted up several pieces this weekend about some of the real inventions of the Victorians, and how they have inspired and resemble the science and machines of steampunk Science Fiction. This is a branch of SF, which imagines what would have happened had the Victorians invented space travel, computers, time machines and were able to journey to parallel worlds. One of the founding works of the genre was William Gibson’s and Bruce Sterling’s The Difference Engine, which was set in an alternative Victorian Britain, which had entered a steam-driven computer age after building Charles Babbage’s pioneering mechanical computer, the Difference Engine of the title. Healey has been described as a man of great strength of mind and character who always had ‘a smile, a question, and a penetrating look’. 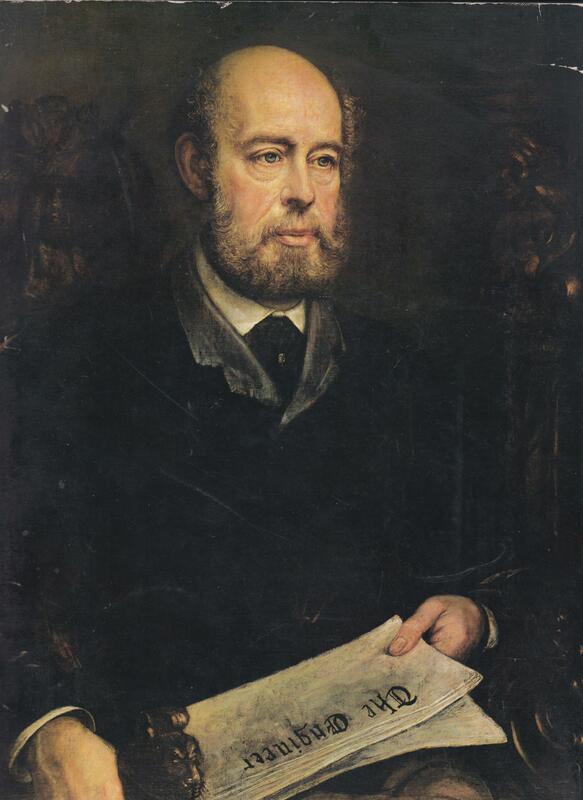 He had financial interests in railways in the Bourdon gauge, and among his many friends were leading men in railway engineering including Robert Stephenson, Isambard Brunel, and Sir William Fairbairn. But there is no evidence Healey used his editorial pages to promote his financial interests. The Engineer pointed out that men of abstract science had done something, ‘but not much for us’. While applied science ‘has done for the physical world everything which science so far provide capable of accomplishing at all – railroads, manufactories, mines, the electric telegraph, chemical factories. And by who is it applied? Why the civil engineer, the mechanical engineer, the mining engineer and the shipbuilder who himself represents an important branch of engineering. ‘The wide earth over, we find the engineer working on principles, dealing with physical truths, using the investigations of those who have preceded him as stepping stones to knowledge, and leaving behind him through each generation mementoes of his labours. Mementoes, the result of a perfect acquaintance with such physical truths as men of the most exalted intellects have discovered-mementoes which will endure when the existence of the “leading journal” has become a matter of history’. Today, when the economy is depressed, is an opportune moment to produce a book which will remind industry of its glorious past and act as a spur to project it into the future. It will also remind engineers and manufacturers of the power, grace and majesty of engineering. Very much the same could be said today. Later this week, one of the topical issues programmes on Radio 4 will be discussing Britain’s critical lack of engineers, and asking how more young people can be persuaded to enter the profession. I’ve said in my previous blog posts that one way could be to link it to the interest people have in restoring and repairing motor vehicles, and the cyberpunk milieu of Science Fiction enthusiasts, who design fashions and exotic machines for this Victorian technological age that never was. Much of the material in the book is about industrial machines and processes, which to most lay people, myself included, probably isn’t that interesting. Such as various types of manufacturing machines, industrial smelters, metal and chemical refining processes, pumping engines and so on. There’s also a chapter on railway engines, which is clearly of interest to steam enthusiasts and the people, who played with Hornby Railway sets when they were children. But the machines and buildings I find the most interesting, are where the Victorians’ ideas prefigure those of modern technology, both real and in the imagined worlds of SF. 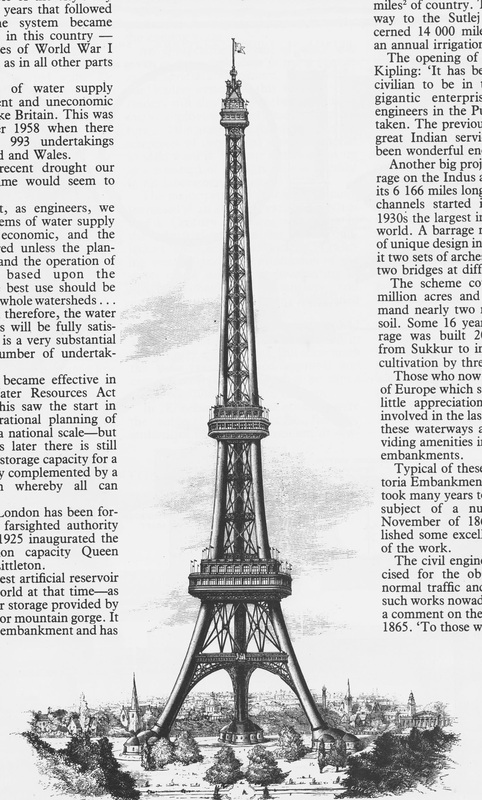 In architecture, the magazines shows two designs for a colossal tower for London, that was intended to rival the Eiffel tower in Paris. One of these shows very clearly the influence of the French structure. Another was more straightforwardly British in design. Except for its size. It was going to be 1,240 feet. We’re almost looking here at the soaring tower blocks of Fritz Lang’s Metropolis, or indeed, Judge Dredd’s Megacity 1. Instead of a channel tunnel, a massive bridge was proposed to span La Manche, and link Britain to France. And to warn ships of dangerous rocks and water, they also designed a floating lighthouse. 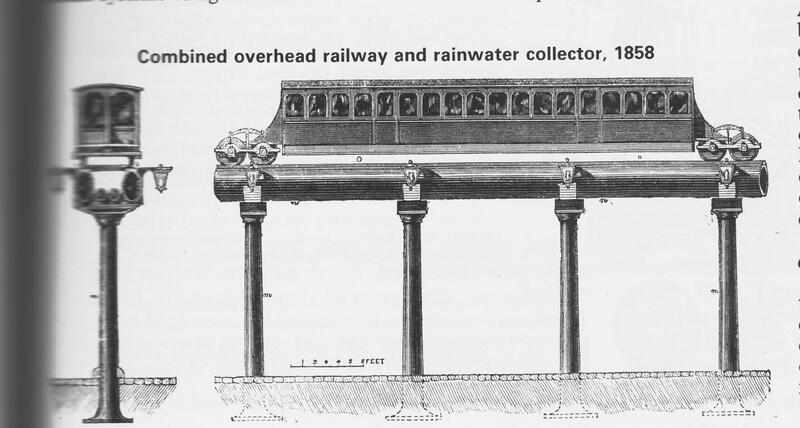 As well as normal railways, they also designed an overhead railway and rainwater collector. 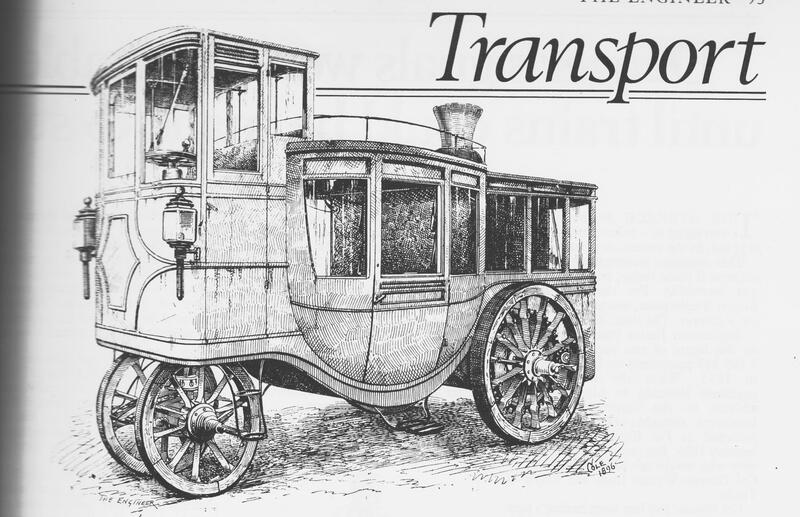 The book also showed contemporary illustrations for the steam carriages and buses that were being developed in this period as the first precursors to modern vehicles driven by the internal combustion engine. This included the Randolph Steam Coach of 1872. 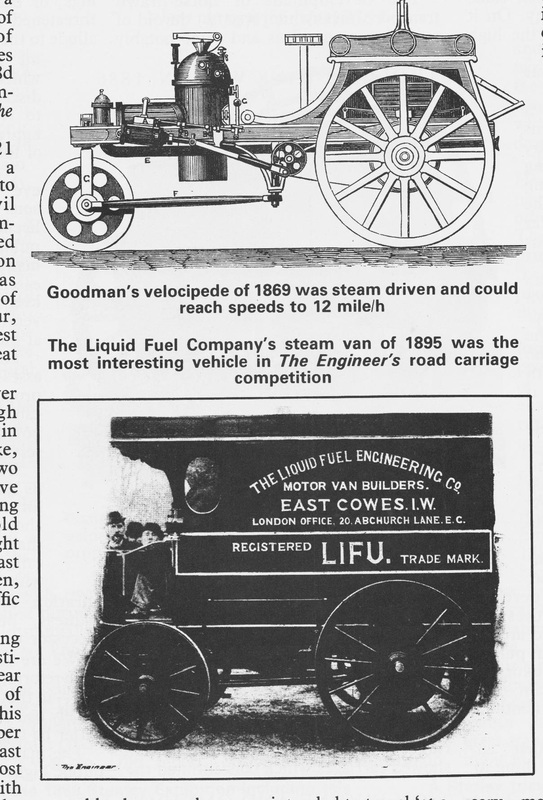 Other vehicles included Goodman’s velocipede of 1868, which could reach the amazing speed of 12 mph, and the Liquid Fuel Company’s steam van of 1985, which was entered in a competition the magazine ran for road carriages. There was also an illustration of a one horse power road steamer, which could carry two people. 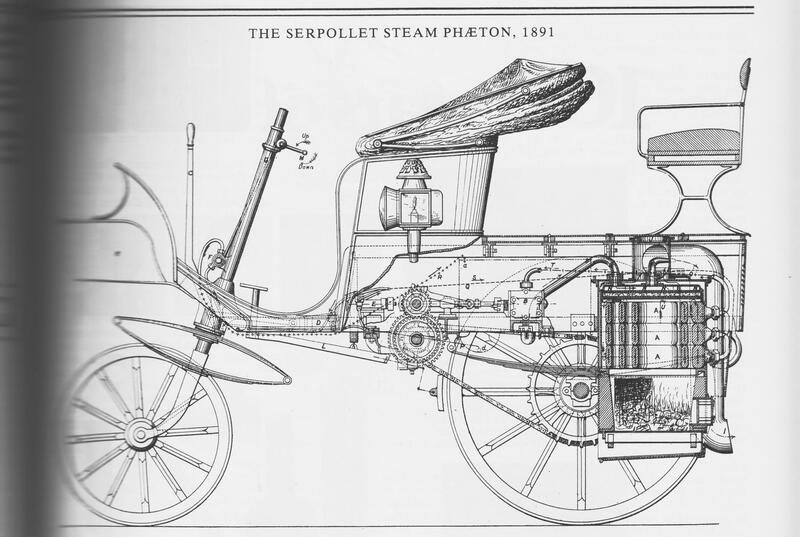 It also included the schematics for another vehicle, the Serpollet Steam Phaeton of 1891. From this, it looks like a budding car enthusiast could possibly build one of these machines, in the same way people also build their own custom cars, and cyberpunk inspired machines like the one I posted up yesterday. 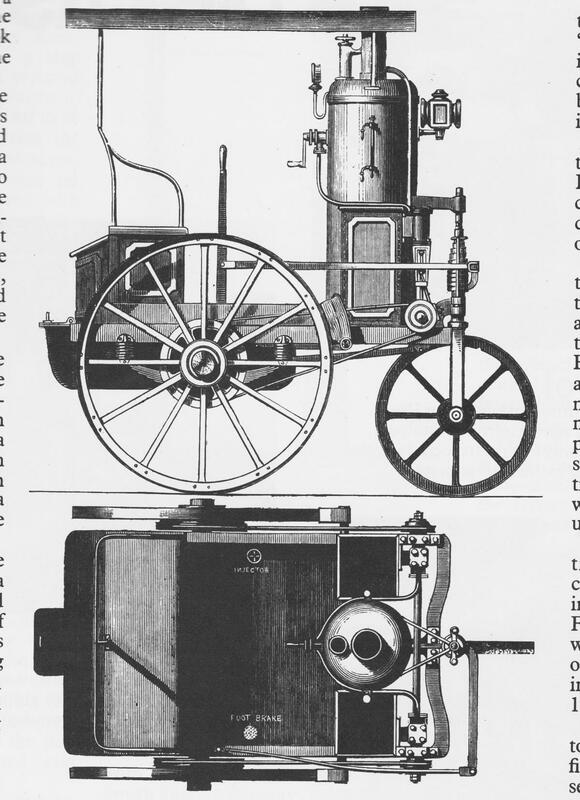 A Mr Nairn, an engineer from Leith in Scotland, also published his design in 1870 for a three-wheeled steam omnibus. 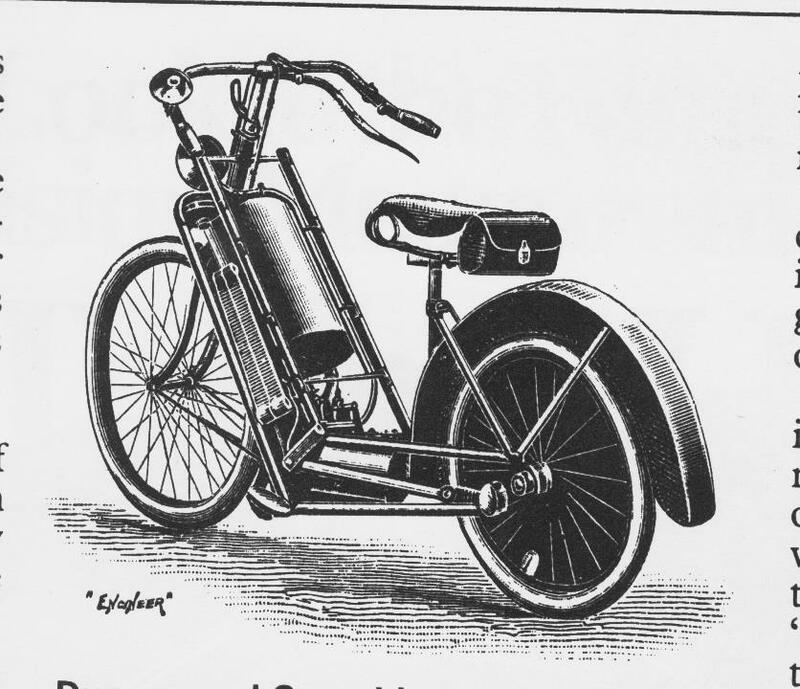 There was also this illustration of an early motorcycle, Duncan and Superbie’s bike of 1894.
and an early car, Panhard and Lavassor’s two-seater from 1894. And to show that waiting at traffic lights were also a blight that afflicted the Victorians, there’s an illustration of the traffic signals at Bridge Street in Westminster in 1868. The Victorians and Edwardians were also experimenting with new ways to move vehicles across ground, such as caterpillar tracks. These included traction engines, such as Ingleton’s Automatic track of 1868. This was engineered to allow the tracks to be raised when the engine reached the end of the field, and needed to make a tight turn. 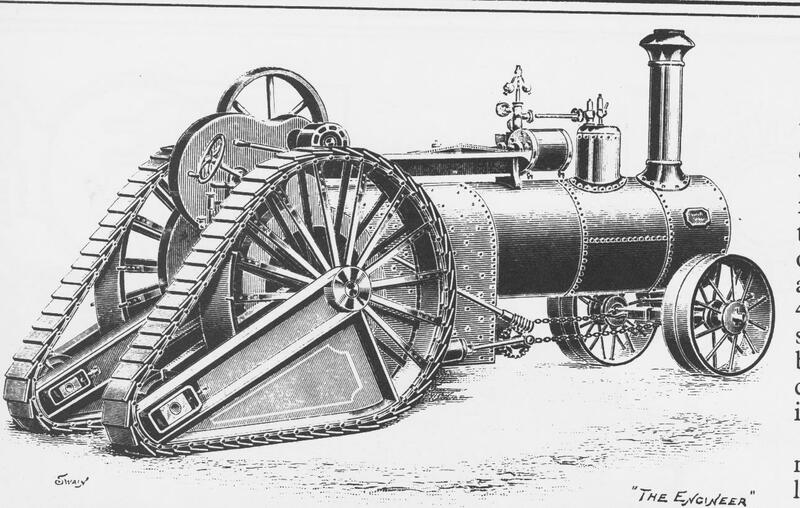 Even after petrol began to supersede steam in the early 20th century, some firms were still experimenting with caterpillar tracks on the new petrol-driven tractors. The photo below shows the caterpillar tractor and train produced by the Holt Manufacturing Company of Peoria in America. 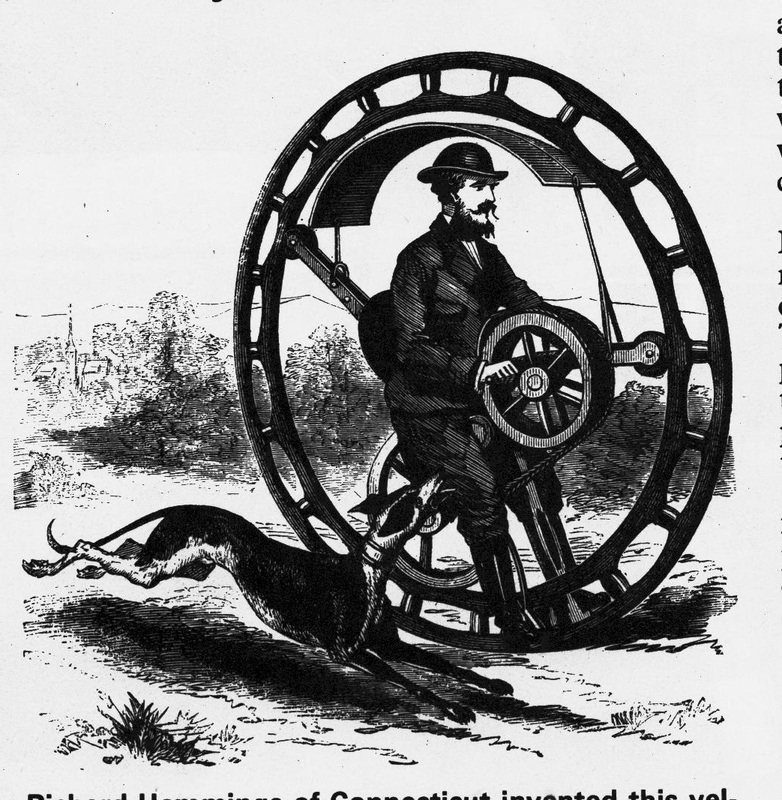 In some cases, the search for alternative means of locomotion went so far as reinventing the wheel. 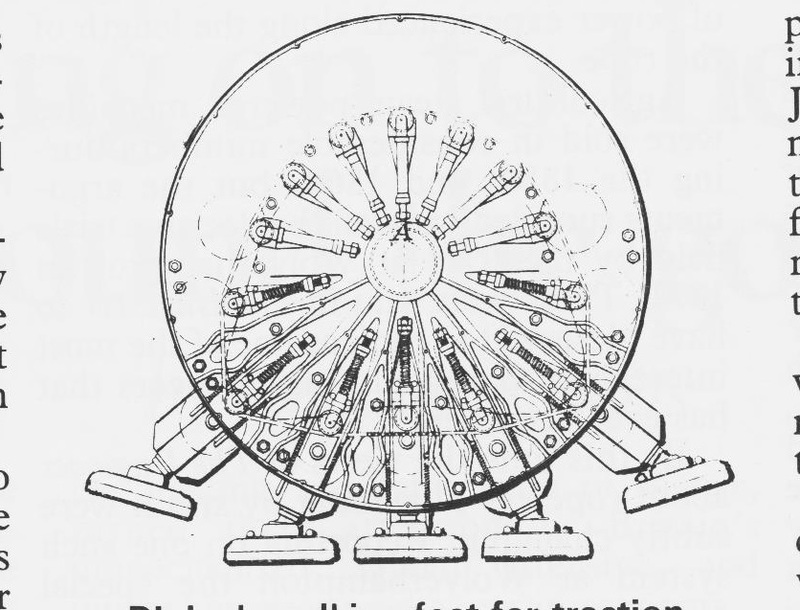 In 1909 Diplock patented a design for putting ‘walking feet’ on a wheel. This is interesting, as H.G. Wells’ The Land Ironclads was about warfare conducted using machines some have seen as predicting the tank. The land ironclads of the title, however, are much more like contemporary naval vessels. They are long, contain rows of snipers along their sides. And unlike tanks, they walk across the ground on mechanical legs like vast, mechanical millipedes, somewhat like the Walkers in Star Wars, but with more legs. 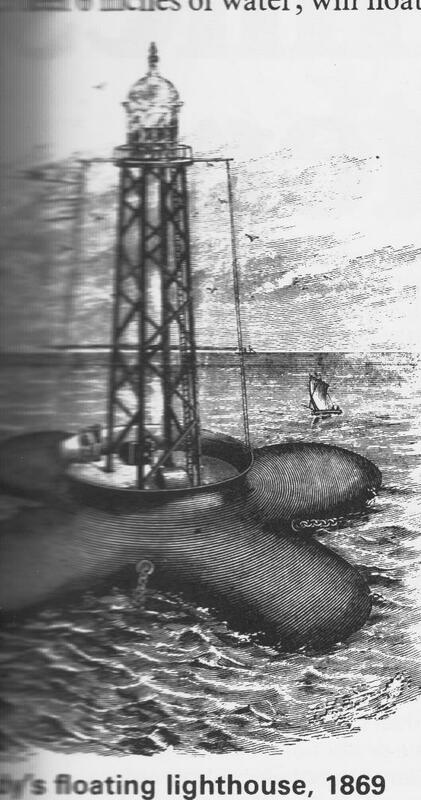 The Victorians were also keen to solve the problems of ships navigating shallow waters. 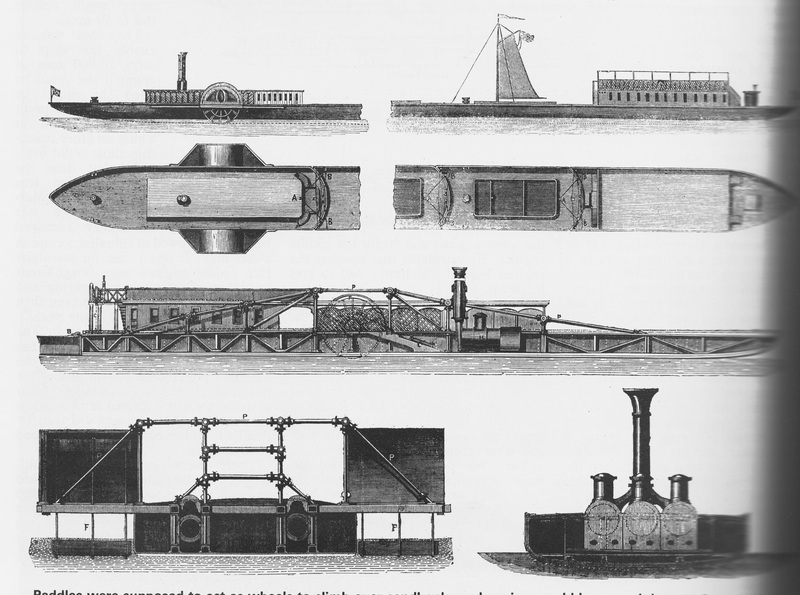 Bourne’s Steam Train, proposed in 1858, attempted to solve this problem through using the paddle wheels as terrestrial wheels, allowing the vessel to climb over sandbanks, and the engine could be geared down to provide more power. It struck me looking at this that if it had been developed further, you’d have had amphibious landing craft like the DUK of World War II. This was also the age in which people were making their first attempts at flight. 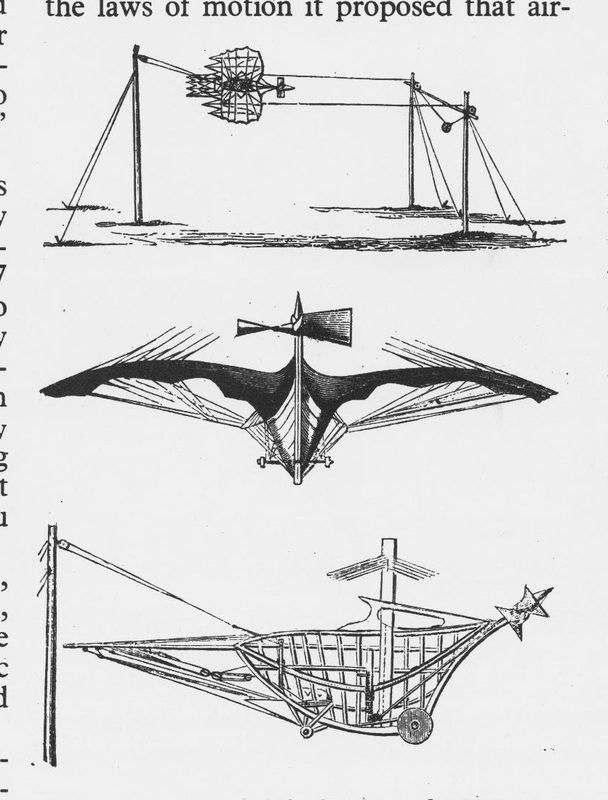 One of the bizarre vehicles featured in the book was Carlingford’s aerial chariot of 1854. This was launched from a pole ranging from 6 to 9 feet in height, carried forward by a falling weight. This was like the Wright Brother’s early planes. Unlike the Wrights’, the aerial chariot didn’t have an engine and the pilot tried to crank the propeller by hand. 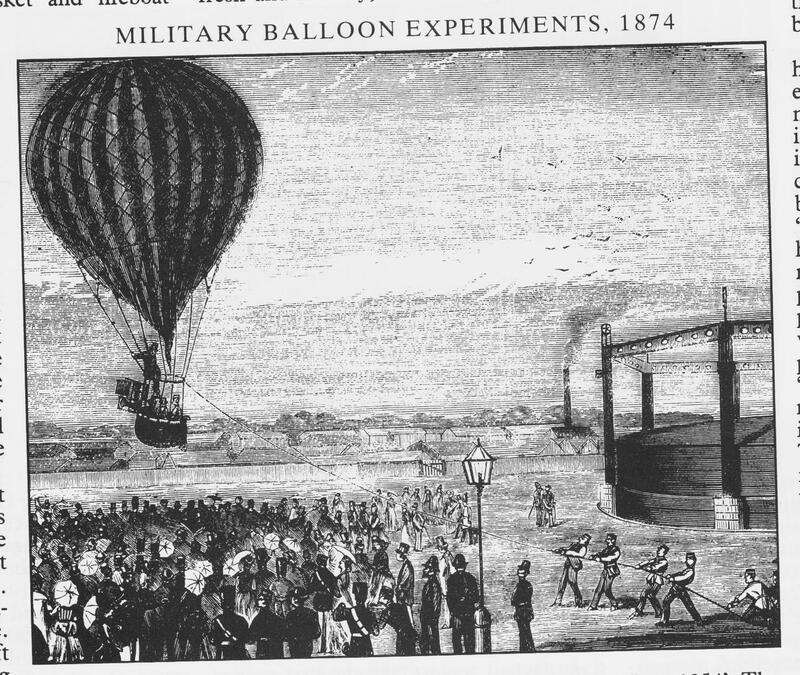 The magazine also published illustrations of the British military’s experiments with balloons in 1874. As well as wings, engineers were considering more exotic methods of flight. 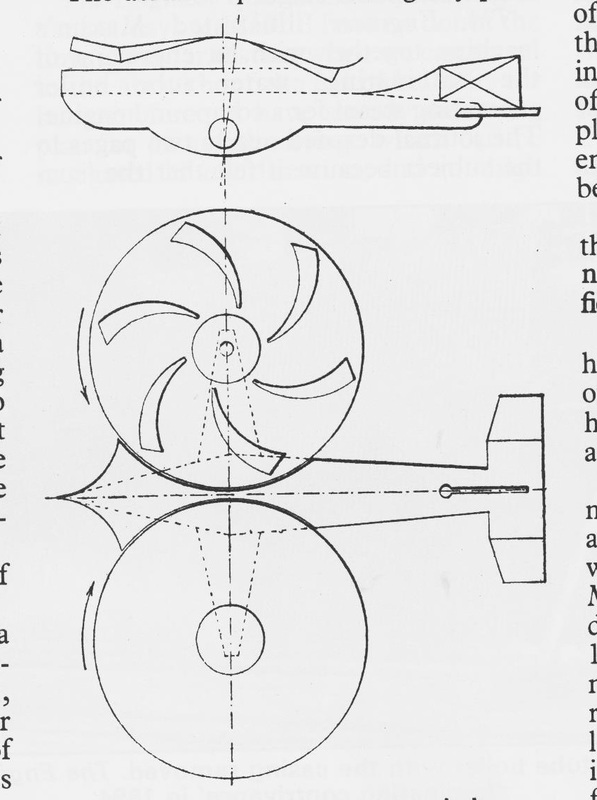 In 1916 there were a series of designs for planes held aloft by spinning discs. Looking at them, it is hard not to see them as the first predecessors of the helicopter. As for balloons, this led to the development of dirigibles like the Zeppelin, a 1923 design for which was also published in the magazine’s pages. Petrol driven cars and motorbikes are now ubiquitous, though there is still great affection and interest in vintage, veteran and historic road vehicles. One businessman in Leckhampton, one of the suburbs of Cheltenham, proudly displayed his early motorcycle from about the time of the First World War in his shop window. The steam vehicles weren’t as efficient as modern petrol and diesel vehicles. They also faced stiff political opposition from traditional, horse drawn vehicles. Nevertheless, you do wonder what Britain would have been like if these machines had caught on to the point where they were the preferred method of transport, rather than horse-drawn carriages. And these carriages, and the other machines and designs shown above, still have the potential to fire the imaginations of fans of historic technology, steam enthusiasts, and Cyberpunks. And perhaps, if more people saw some of these machines and their designs, some of them might try to make some of them. This would not only bring them to life, but also possibly inspire more people to take an interest in engineering and the great heritage of invention. Steampunk Car – and the Real Victorian Vehicle that Inspired It? 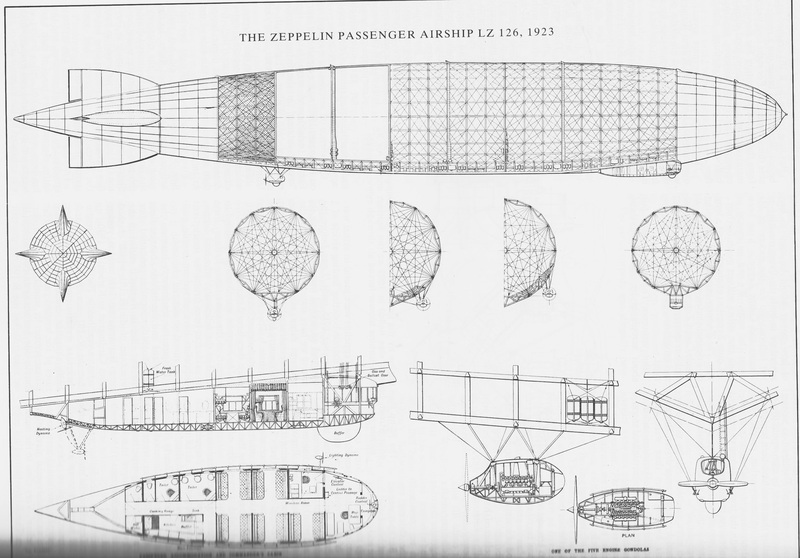 On Friday I put up a post about the Science Fiction sub-genre of Steampunk, and some of the real Victorian inventions that have inspired it, and which even today seem like things from the imagination of H.G. Wells and Jules Verne. Steampunk takes its imagination from 19th century Science Fiction writers like Wells and Verne, and pioneering scientists, such as Charles Babbage, the inventor of the first mechanical computer, the Difference Engine. It imagines what might have happened, if the Victorians had developed space travel, time machines and a true information age. William Gibson and Bruce Sterling depicted a Victorian Britain, which had indeed entered a steam-driven, mechanical computer age following the construction of Babbage’s machine in their 1990 book, The Difference Engine. This week, one of the topical issues programmes on Radio 4 is going to be discussing Britain’s serious lack of engineers, and ask how more young people can be persuaded to take up the subject. It’s a complex issue, but I suggested in my piece that one way might be to harness the interest in Victorian-style SF hardware that exists amongst the fans of the genre. I also noted that you could possibly combine this with an appeal to the petrolheads, whose hobbies are restoring and working on cars and motorbikes, by getting people interested in the real, steam-driven motor vehicles that were developed during the 19th century on the way to the invention of the modern car. There are steampunk conventions in Britain, America and other parts of the world. The other year, Phil Jupitus presented a programme on it on Radio 4. The members of the genre wear Victorian-style clothes, weapons, and pseudo-scientific devices inspired by the esoteric technology of this age that never was. And some of them have made their own, steampunk road vehicles. This is a very brief clip of one such car I found on YouTube, which had been lovingly made by a fan of the genre. The blurb about it on YouTube merely describes Steampunk as a genre, but doesn’t say anything about the car itself. 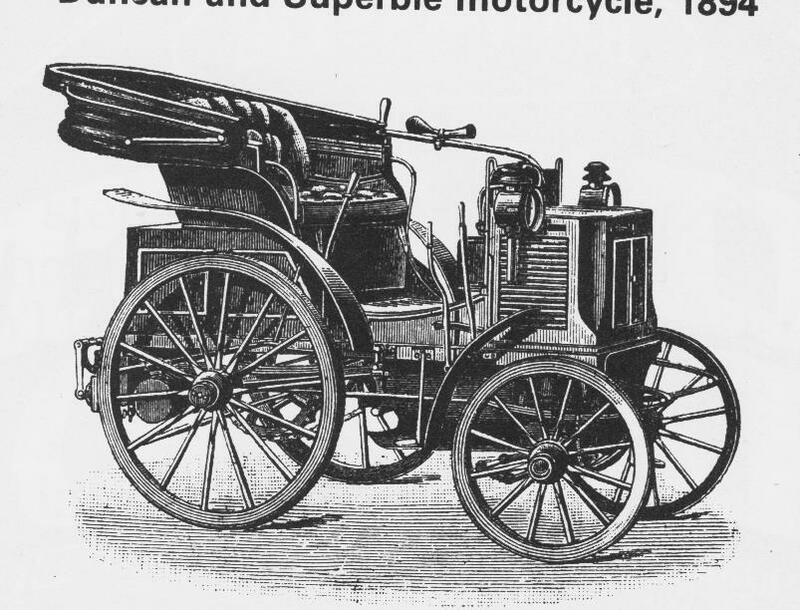 But the metal semicircle arcing over the vehicle suggests that it was partly inspired by a real Victorian invention, the velocipede designed by Richard Hemmings of Connecticutt, in 1869 (below). Hemmings said that his five year old son could propel a similar machine of about 5 feet ‘at a good pace’. 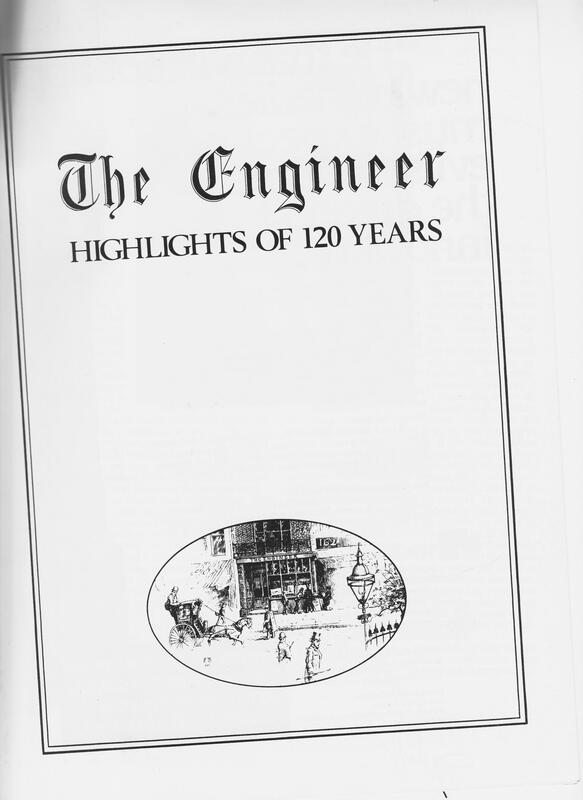 From Jeremy Sumner, ‘How Pedal, Steam and Petrol Put Horse Power Off the Roads’, in John Mortimer, ed., The Engineer: Highlights of 120 Years (London: Morgan-Grampian Ltd 1976) 124. Looking through this book, which is a glossy, commemorative edition of the magazine, is fascinating for anyone with an interest in the history of technology, and carries a treasure-trove of inspiring ideas for enthusiasts of the genre. There are real life steam carriages and buses, a mid-Victorian mechanical traffic signals, an amphibious paddle steamer, a Zeppelin, and a petrol-driven tractor from 1916, which ran on caterpillar tracks. 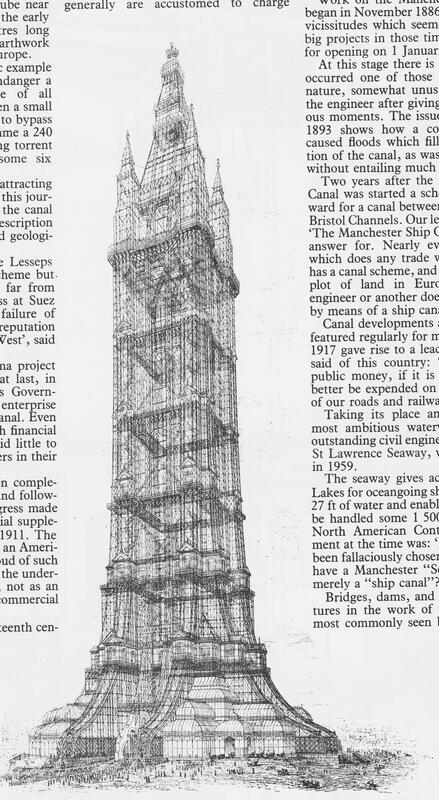 There are also designs for great towers in London to rival France’s Eiffel Tower, including one which would have been 1,240 feet tall. And instead of the Chunnel, Britain and France would have been linked by a truly colossal bridge. I intend to post a piece about the book and its astounding and inspiring inventions later. I’ve no doubt that many of the people building vehicles and other gadgets based on their own interest in this particular genre, probably have an interest in science and engineering anyway. But the fact that people are trying to recreate and create science fictional Victorian cars and other machines shows that the steam punk genre does possess the power to inspire people with an interest in science and invention. Just as, no doubts, early generations were drawn to space and astronomy through the adventures of Dan Dare. 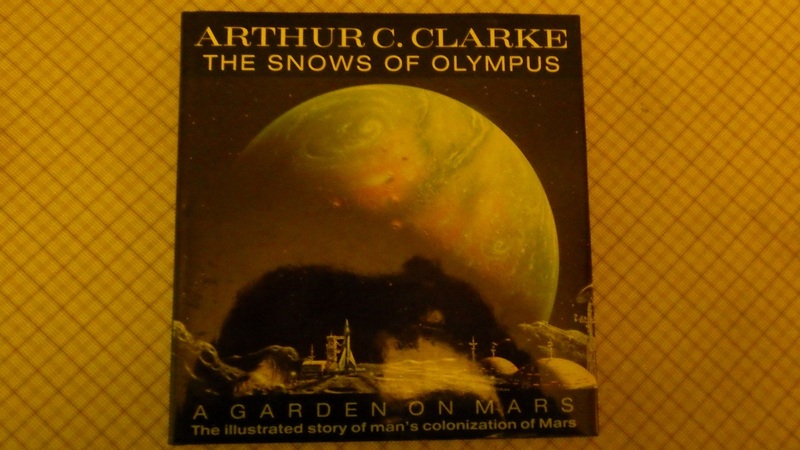 Arthur C. Clarke – The Snows of Olympus: A Garden on Mars – The Illustrated History of Man’s Colonization of Mars (London: Victor Gollancz 1994). A little while ago I put up a number of articles on the possible terraforming of various planets in our solar system. The prime candidate at the moment would be Mars, but people have also suggested ways to terraform Venus and the Moon. I’ve managed to dig out from my bookshelves a copy of Arthur C. Clarke’s book, The Snows of Olympus, which I bought way back in the 1990s. Clarke’s been called ‘The Space Prophet’ because of his article published in a radio hobbyists’ magazine shortly after the War predicting geostationary communications satellites. He has jokingly said in an article ‘How I Lost a Million Dollars in My Spare Time’ that he should have patented the concept, and so made himself a billionaire because of its immense value to the telecommunications industry. This book is no less prophetic in that it uses computer simulations to depict the gradual greening of the Red Planet over a thousand year period from the next few centuries to c. 3000. The book has a prologue, in which Clarke gives the text of a speech he gave to future Martian colonists as part of the Planetary Society’s ‘Visions of Mars Project’. Launched by the late and much-missed astronomer and space visionary, Carl Sagan, this was a project to send the future colonists the gift of a collection of SF short stories about Mars aboard two probes due to land there. There’s then a short introduction in which Clarke lays out the aims of the book. The first chapter, ‘Prelude to Mars’, discusses the history of the exploration of the Red Planet by terrestrial astronomers and writers, such as Giovanni Schiaparelli, Percival Lowell, H.G. Wells and Edgar Rice Burroughs, C.S. Lewis in Out of the Silent Planet, and the controversy surrounding the supposed ‘face’ on Mars, made by Richard Hoagland and others. Chapter 2 – ‘The Curtain Rises’ – is on the probes sent to explore Mars, such as the Mariner probes and discussion between himself, Sagan, Ray Bradbury and the JPL’s Bruce Murray at the Jet Propulsion Laboratory on the probes and their findings. He goes on to discuss Viking probes and the debate about American and Russian cooperative ventures in space research. This last ended for a time because of international tensions created by the Solidarity crisis in Poland. Chapter 3 – ‘Going There’, describes the problems and suggested methods for reaching Mars, establishing crewed bases there, including various types of rocket from the conventional chemical to nuclear-thermal and atomic; solar sails and space elevators, George Bush seniors’ intention to launch a crewed mission to Mars by 2019, and the tasks that would immediately face the astronauts landing there. Chapter 4- ‘Virtual Explorations’ is on the use of computers and VR to explore and map Mars, and particularly the Vistapro programme used in the generation of many of the images in the book. Chapter 5 is on the artistic and computer depictions of Olympus Mons, the planet’s highest mountain and the gradual reclamation of its surface by vegetation, beginning with lichens, during the long centuries of terraforming. This culminates in the emergence of liquid water and creation of a sea surrounding the mountain. Chapter 6 does the same for Eos Chasma, the ‘Chasm of the Dawn’, in the Valles Marineris. Chapter 7 shows the same process as it would affect the Noctes Labyrinthes – the Labyrinth of Night. This forecasts the growth of forests in this part of Mars, beginning with pines but later including deciduous trees. Chapter 8 – ‘The Longest Spring’ discusses the various methods that could be used to terraform Mars, such as coating the ice caps with carbon from Mars’ moon, Phobos, the use of orbiting mirrors to melt them, raising its temperature by turning Phobos into a miniature sun for about 40 days using ‘muon resonance’ – a form of nuclear reaction, and bombarding the planet with comets to cover it with water, and ‘Von Neumann’ machines that would gradually terraform the planet automatically. ‘Disneymars’ looks forward to a museum display and audiovisual presentation that would show the colonists what their planet would look like in the future as the terraforming progresses. Chapter 9 – ‘Concerning Ends and Means’ discusses the moral dimension of terraforming, the immense historical importance of exploration and the need to continue this exploration to the Red Planet in order to preserve human civilisation and progress. There are two appendices. The first is an extract from a speech, The Mars Project: Journeys beyond the Cold War, by US senator and WWII hero, Spark Matsunaga. The second, ‘So You’re Going to Mars’, is fictional advice given by the immigration authorities to people moving from Earth to Mars. The quality of the computer graphics is mixed. Many of them, which were without doubt absolutely astonishing for the time, now look rather crude and dated as the technology has improved. Others, however, still stand up very well even today. 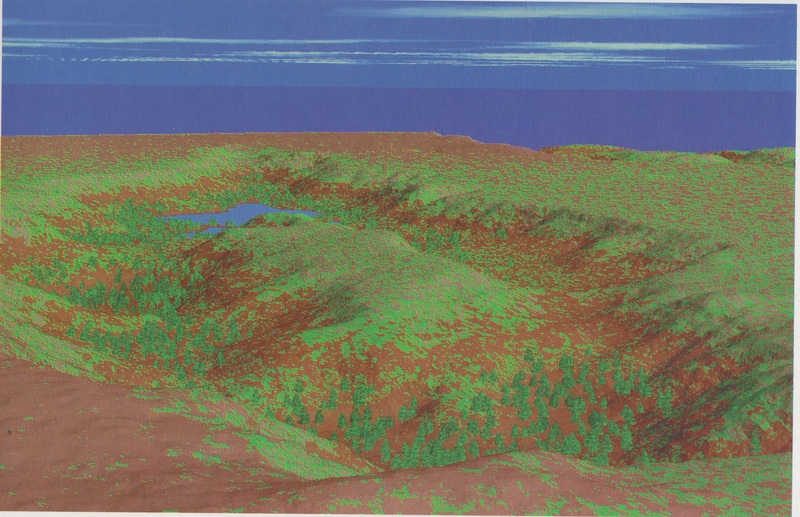 The quality of the computer simulations of the terraforming process can be seen from this image below of what Eos Chasma might look like in 2500 AD. There are also plenty of illustrations of Mars, rendered using more traditional artistic methods such as painting, including photos of Percival Lowell’s own drawings of what he believed was the planet’s network of canals. Although the computer tools may have been superseded and improved in the decades since the book’s publication, I think the science, and the social issues Clarke discusses, are still solidly relevant and contemporary. Certainly there is now a popular movement to send humans to the Red Planet at some point in the coming decades, and prospective future colonists have even come forward to volunteer a few years ago. There is, however, a greater awareness of the medical dangers from radiation and microgravity that would affect – and possibly destroy – a mission to Mars. The dream, however, is still there, as shown by the success of the film The Martian a few years ago. Looking along the Science Fiction shelves in Waterstones in Bristol last week, I found a large selection of H.G. Wells’ books are now being republished. These include not only well-known favourites like The Time Machine, The War of the Worlds, First Men in the Moon and The Island of Dr Moreau, but also two of his explicitly political SF novels, When the Sleeper Wakes and A Modern Utopia. When the Sleeper Wakes is about a merchant banker or stockbroker, who falls asleep and wakes up centuries in the future to find that his activities have created a nightmare capitalist dystopia. A Modern Utopia is about a group of travellers from our world, who enter an alternative reality in which the Earth is ruled by a single world government, everyone speaks the same language and there is complete racial and sexual equality. On the negative side, it also shows Wells’ disdain for democracy, as political power is held by four ‘samurai’, unelected guardians with absolute power. I haven’t bought them, and so don’t know what they’re like. However, it’s clear that they are vehicles for Wells’ socialist views, like his The Shape of Things to Come.